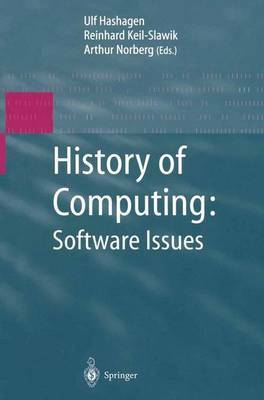 The papers in this volume were presented at a conference that was designed to map out historical study needs in one area of the history of computing, namely, software. The Paderbom conference was sponsored by the Heinz Nixdorf Muse- umsForum and co-sponsored by the Charles Babbage Institute and the Heinz Nixdorf Institute of the University of Paderbom. The idea for the conference emerged from the consideration of a larger concept that was to prepare a new handbook on the history of computing. Believing that preparation of the handbook would encounter obstacles in some areas of computing that have not received adequate attention from historians, the originators of the idea of the handbook decided on aseries of mapping conferences to try to overcome the obstacles, of which the Paderbom conference is the first. The organizers of the conference invited a group of historians, sociologists, and computer scientists to present pa- pers and comments about a selected set of issues in the history of software. The organizing committee consisted of William Aspray (Computing Research Asso- ciation, Washington, D. C. ), Martin Campbell-Kelly (University of Warwick, U. K. ), Ulf Hashagen (Heinz Nixdorf MuseumsForum, Paderbom), Reinhard Keil- Slawik (Heinz Nixdorf Institute, University of Paderbom), Michael S. Mahoney (Princeton University) and Arthur L. Norberg (Charies Babbage Institute, Uni ver- sity of Minnesota).